Xiaomi is working on a next-generation version of the in-display fingerprint scanner technology that it included on its Mi 8 Pro handset last year. The sensor works in an almost identical way to the Huawei Mate 20 Pro and OnePlus 6T, which also incorporate the fingerprint scanner beneath the glass display. These smartphones boast a limited area to scan fingerprints, similar in size to the physical fingerprint scanners found on the front and back of most modern handsets. Given that it can be a little tougher to find the exact spot on the display to place your finger when its a single, uniform sheet of glass – and not a standalone sensor – Xiaomi hopes to dramatically upgrade how the in-screen scanner works on its next phone. Xiaomi President Lin Bin recently shared a post on Chinese social network Weibo that revealed plans to build a much, much more advanced implementation of the embedded fingerprint scanner technology. 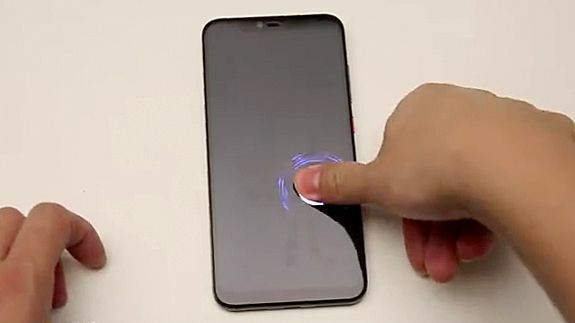 The Xiaomi co-founder shared a video of a prototype smartphone that includes a new type of biometric sensor with an active area of some 25 x 50mm, meaning users can authenticate their fingerprint by tapping almost anywhere on the screen. Based on what we've seen in the short demo, it's considerably larger than anything else available on rival Android smartphones at the moment. According to Lin, the new sensor should not only eliminate the need to hunt around the screen to find the exact area where you need to place your fingertip to unlock the device, but it can also be used to wake and unlock the device with a single tap. Xiaomi isn't the only manufacturer investigating larger in-screen fingerprint scanners. Last year, rival firm Vivo unveiled a concept smartphone, dubbed Apex, which had a "half screen" sensor that allowed users to place their digit anywhere on the bottom half of the display to authenticate apps and unlock the device. Oppo has also teased work on a new generation of in-display fingerprint scanners that are purportedly 15 times larger than existing implementations. However, Vivo and Oppo have yet to confirm finished products that use the system. According to the latest whispers from the supply chain, the new in-display fingerprint scanner teased by Xiaomi President Lin Bin will be included in a new smartphone set to debut at the Mobile World Congress tradeshow in Barcelona.